AutoDesk CEO Carl Bass’ keynote at the recent Inside 3D Printing Conference and Expo in New York City expanded the focus from 3D Printing to the broader area of Digital Fabrication. As anyone who has read my blog posts about Fab Labs will know, 3D Printing is just one tool in the Digital Fabrication world that uses Computer Aided Design or CAD files to tell machines where to take away or add material. Whether using laser machining – subtractive manufacturing – or 3D Printing – additive manufacturing – the CAD file is the brains of the process. 3D Printing proponents could argue with Mr. Bass’ predictions that there won’t be a 3D Printer in every home and that 3D Printing will not be the main driver of a next Industrial Revolution. But they cannot argue that at least in its current and near future state, 3D Printing is just one tool in the Digital Fabrication toolbox. And to prove his point, Mr. Bass gave some astonishing examples of companies that are integrating 3D Printing with traditional processes. A division of machine tool giant DMG Mori has actually designed one machine that delivers both additive and subtractive processes. 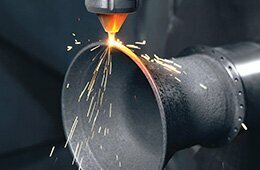 The Sauer Lasertec all-in-one tool swaps the head of a 5 axis milling machine with a laser metal deposition powder nozzle as needed for the most complex part manufacturing. As anyone who has had to post-process a 3D Print will testify, simple steps from trimming with a razor blade to water jet blasting is often required to finish a part, so in many cases even for home projects, makers are combining fabrication methods. Another key point in Mr. Bass’ presentation was that computing has been underutilized in the design phase. Often when a designer wants to switch to 3D Printing a part, they simply convert the design to an .stl file. This doesn’t take into account the unique capabilities of 3D Printing technologies, plus in Mr. Bass’ opinion, design specific to 3D Printing could eliminate need for a lot of post-processing. Perhaps, key here is education of designers and yet another opportunity in the 3D Printing marketplace. AutoDesk is working with Airbus on software algorithms that actually demonstrate locations on a plane for maximum and minimum strength requirements. Mr. Bass says “industrial 3D Printing will be incredibly important. We have way overvalued consumer and underappreciated industrial 3D Printing”. Perhaps as part of the bigger Digital Fabrication picture, 3D Printing will have a strong role in the coming Industrial revolution, and as Mr. Bass put it, “we will change the way we think of how products are made”. We’re already seeing that happening, if not as the Star Trek replicator in every home, then on the factory floor.